Can You Ride A Giraffe? How Fast Can A Giraffe Run? How Long do Giraffes Live? Few animals are as recognizable and as distinctive as the giraffe. But are there any giraffe characteristics that not many people know about? One of the unusual characteristics of the giraffe is that it has the same number of vertebrae in its neck as any other mammal, which is seven. The giraffe shares this number with dogs, cats, mice and even human beings. The main difference is just that the giraffe’s vertebrae are so much longer than those of other mammals. These long neck bones help make the giraffe the tallest animal on earth. Male giraffes can be 19 feet tall from horn to foot and they can weigh as much as two tons. Females are about three feet shorter than the bulls. When a giraffe calf is born, it is already about six feet tall. All giraffes have distinctive patches on their coats depending on what habitat they live in. The patches can come in different sizes and shapes and can range from yellowish to black. The giraffe is born with his or her coat pattern and it stays with that pattern throughout its life, but the color can change according to the state of the animal’s health or the time of year. 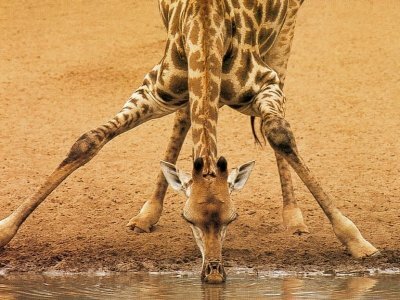 The giraffe has long, stilt-like legs and their front legs are considerably longer than their back legs. This gives their backs a very steep slope. 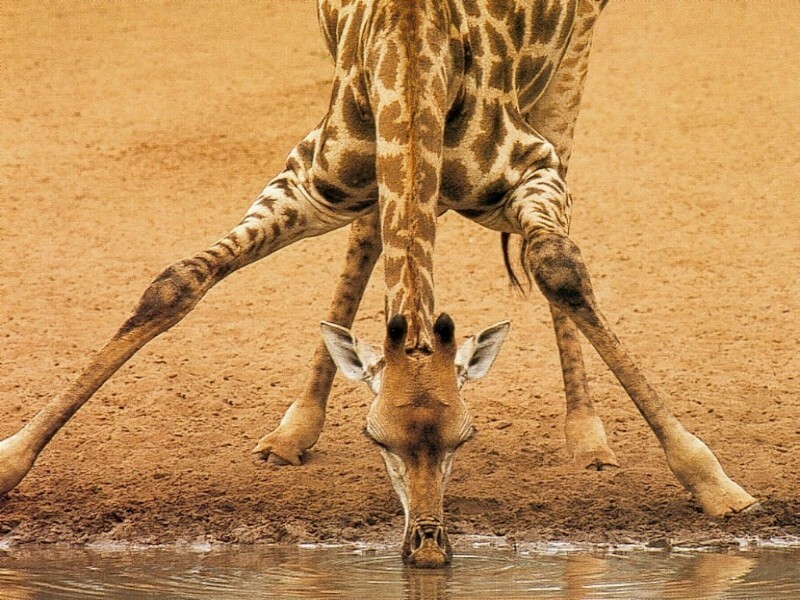 It also makes them have to splay their front legs when they want to have a drink of water at the local watering hole. Giraffes also have slender tails that can range from 30 to 40 inches long with a black whisk at the end that discourages biting insects. Giraffes have horns, but unlike deer antlers, their horns are made of bone covered with skin, so they are permanent. Both male and female giraffes have horns. Males sometimes have two pairs of horns. Giraffes also have big, dark eyes and long black tongues that help them pull leaves and even thorns from the tree tops.